I have mentioned already the RAF 3 volume record; History of the Royal Air force in World War II, in which the RAF airfield at Winkleigh simply does not exist! Now, on the other hand, if you take a look at the Canadians version of its war time history 'The RCAF Overseas' it's a different story altogether, with some 20 pages dedicated to Winkleigh in Devon and its RAF base. They loved it here and certainly made themselves at home. An interesting observation, sent to me recently by a war time evacuee to Winkleigh with fond memories of the Canadians, concerned their natural attraction to local cider! He recalls many an airman, not used to cider being full of alcohol ( Canadian cider is a different thing altogether, we call it Apple Juice!!!) being either carried out or falling out of the Kings Arms and being leaned up against the Village Pump to sober up! Fumerton was described as a big, strapping guy with a deceiving gentleness and a row of decorations and rightly so because Moose Fumerton was to become the top Canadian night-fighter ace of World War II and is credited with 14 aerial victories. 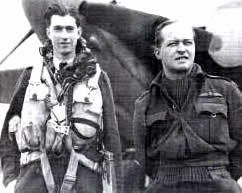 These men made an indomitable pair, both leading their squadrons from the front and always itching for a go at the enemy. 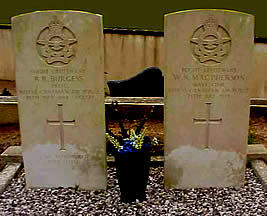 They were tireless and brave commanding officers. The D Day Orders - Operation Bigot. In his memoirs, Moose Fullerton tells us of his role in 'Operation Bigot' so secret that he could not even discuss it with his counterpart Douglas-Hamilton. he speaks of the dramatic responsibility placed in his hands on June 4th by his superiors in personally delivering the D Day orders out of RAF Winkleigh to various airstrips in the South West. This task he accomplished by meeting motorcycle outriders at the individual air bases and whilst keeping the engines going, passed on the top secret documents for internal delivery straight to each CO. 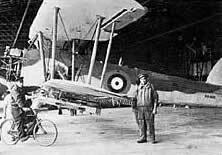 He would repeat the process to every airfield across the South West of England. Wing Commander Fummerton, DFC., AFC. Retd, in a letter of November the 6th. 1994 from his home in Toronto, recounts the story of the D Day orders. It must have been quite a sight and a daunting honour? Wing Commander Russell Bannock DFC, DSO & Bar Born Russell Bahnuk. By July of 1944, Squadron Leader Blackie Williams, having been awarded a DSO for his actions against 7 Dornier DO 217 aircraft over Brest in France, then took over the command of the Canadian Squadron at Winkleigh. 47 aircraft confirmed destroyed, 15 vehicles, 68 trains, 3 barges 2 submarines and 3 power stations. "An epic evening in Squadron annals...."
...when after midnight, some 35 enemy aircraft operated in scattered fashion, with Bristol as their objective. P/O D.J.McConnell and F/O Michael James Kazakoff in a Mosquito they named "The Impatient Virgin". 1 Ju. 88 probable, 1 unidentified damaged. F/L H.D.McNabb & F/S A.F Tindall - 1 Ju.88 probable, 1 unidentified damaged. Total: 4 Destroyed, 3 probable, 1 damaged, for no losses. 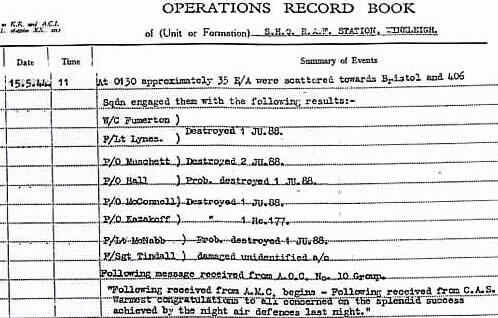 *With thanks to Mr. Jack Webster in Ottawa, Canada for his assistance in correcting an error appearing in the operations record book. We are pleased to correct to oversight. Old comrades will be sad to learn of the passing of Flight Officer Michael James Kazakoff. December 2nd 2010 at the age of 89. 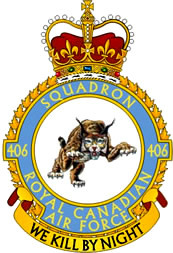 RCAF 406 Squadron played an enormously important role in the war with their Beaufighters and Mosquito attack planes. Completing an impressive, dedicated service in the annals of war. by shelling. These actions had won the squadron three D.S.O.’s, one second Bar to the D.F.C., one Bar to the D.F.C., fourteen D.F.C.’s, two D.F.M.’s and four Mentioned in Despatches citations. 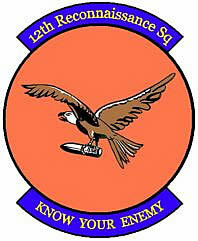 The squadron flew over 1800 sorties in the four years they were operational. 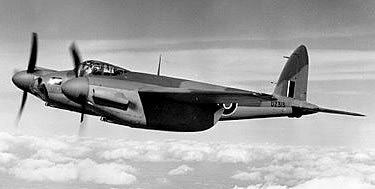 During night fighter activities it lost eight aircrew & as an intruder unit its casualties were twelve killed and two taken prisoner. 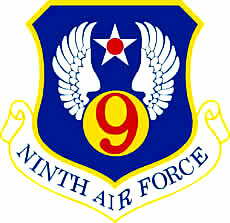 Non-operational accidents took the lives of 13 squadron members. One such 406 mission is recounted below. The last flight of Burgess and MacPherson. took to the sky for routine patrol over France. The weather continued to be perfect, giving the young pilots first class visibility and stunning views to the south as they crossed the Channel. 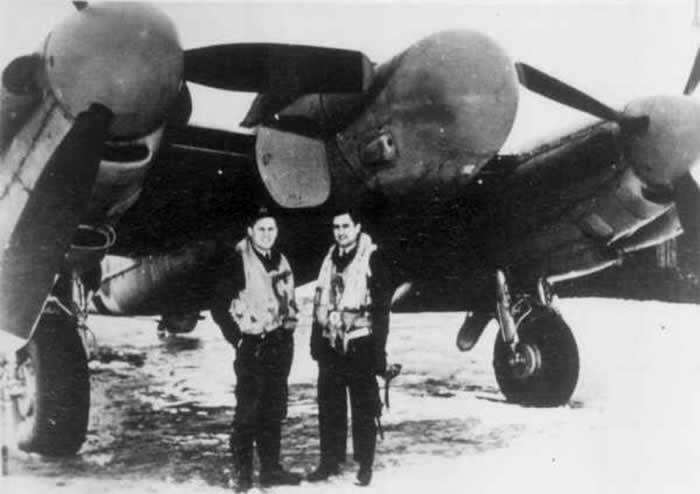 At approximately 15:15 hours on July 25th 1944, a Mosquito XII attack plane piloted by Flight Lieutenant Ray Burgess of Biggar Saskatchewan and navigated by Flight Lieutenant Navigator Bill MacPherson of Wallenstein, Ontario, out of 406 Squadron based at Winkleigh in Devon, caught sight of two German fighters based close to Varades near Nante in the Loire-Atlantique. They were closing in on them fast. The Mosquito pilots, both old hands at such tactics, immediately took avoiding action and engaged the bandits with ferocious cannon fire. 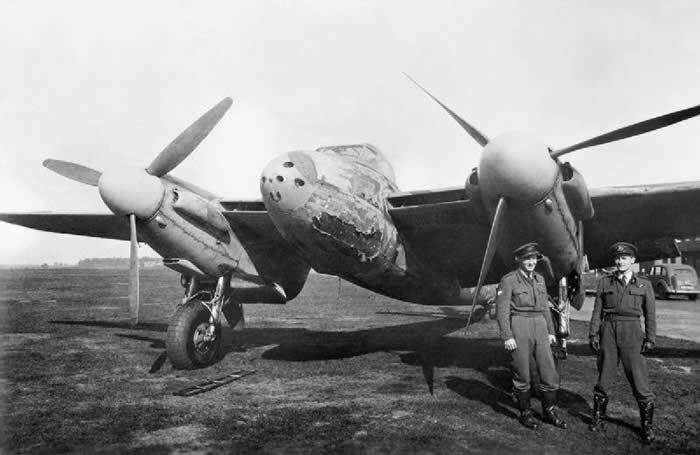 But the German planes veered off on different tacks, only to fall upon the stricken Mosquito with devastating results. One of the German fighters suddenly gained altitude and fell upon his prey, firing on the Canadians plane and riddling it with bullets. The crippled aircraft plummeted out of the sky. Burgess struggled vainly with the controls of the dying Mosquito which swung in a slow, lingering arc above the village of Meilleraie. But already on fire, it hung for just one dreadful moment above a nearby forest, before being crushed in a horrendous explosion. Farm workers in a nearby corn field were harvesting in the sunshine that afternoon and had little time to dive for cover as the aircraft hit. A group of Boy Scouts, camping not from the crash site, rushed to the scene but heat and flames, now visible for miles and continuous explosions from igniting ammunition was too great a risk and nothing could be done. Young and old from the village, some with Red Cross arm bands arrived on bicycles including Marie-Therese Brunet and Joseph Muloise and stood silent as two charred bodies were reverently recovered from the crash site and laid on sheets in the field. The Mosquito had ended barely 150 meters from the meadow where the Huard family was working and Monsieur Eugène Huard Senior remained at the crash site with his combine harvester as his son Eugène Huard Junior (20), went to stable the horses. Their eye witness reports tell of how an hour and a half passed when the German fighter plane’s pilots emerged from the road toward Sorgne in the company of an interpreter having landed after the engagement at their temporary air base on an airstrip near Varades.
" The Germans did not salute the mortal remains of the two Canadian aviators but rolled them over with their feet and searched their pockets for their identification papers and money. A short while later, a German officer of the " Kommandatur "arrived. He saluted the bodies of the Officers and ordered that the municipality arrange a burial in the cemetery, but without a procession." The German order naturally would not be respected. The region was a stronghold for the free French and resistance movements and their hatred for the Bosch utter, patent and complete. Full well, the people would be aware of the efforts of other Allied squadrons and their efforts in support of the resistance. During the evening, the airmen's bodies had been taken to Jean Cottineau’s barn and the local carpenter Ms. Muloise was tasked with making coffins. The following day, Wednesday July 26th, Mr. Eugène Huard junior, took his black mare named "Fanny" and went to the village of Riaillé to get the hearse and a funeral procession assembled. There were many flowers at the funeral which followed and over 200 people followed the coffins of the two young Canadian airmen to the village church which was crammed with over 400 French mourners. placing flowers on the Canadian aviators graves for over 60 years. 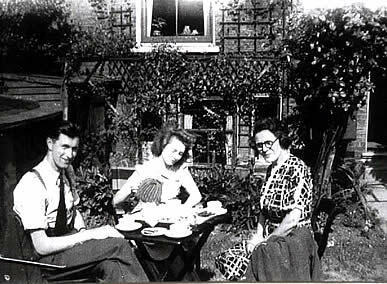 William MacPherson and his wife Pauline taking tea with their 'Landlady' somewhere in Winkleigh just before his death. Photograph - RAF Winkleigh - Devon - UK : August 23rd 1944. Seated; Cpt.Clyde Lattin, FO Jack Fenn, LAC Doug Long, LAC John Lindsay, Cpl. Alf Loach, Manley J Richardson Cprl. Horace Red Macaulay, LAC Jim Scaffter. In the History of RAF Winkleigh, one cannot miss out the contribution made by the RDF Radar Technical staff of the RCAF 406 Squadron. For it was to them that pilots and air crew turned for the installation and servicing of the best and most innovative early warning systems yet devised. DF [Radio Direction Finding] Technician Bob Mc Dowell photographed here at RAF Winkleigh (right) is on his way to carry out his daily inspections of the top secret and sophisticated radar equipment, SCR 720 (MkX) AI, which was assigned to the Canadian 406 Lynx Squadrons - Mosquito strike aircraft during World War 2. The photograph is taken by: Horace. "Red" Robinson Macauley, (Nepean, Ontario. Canada) Red was an airborne radar technician based at Winkleigh with Bob, involved with testing and development of the onboard radar systems. "External power was used to run up the aircraft radar equipment and this was provided by this small gasoline engine that ran a generator delivering 80 volts ac and 12 or 24 volts dc as required. The equipment was mounted on a two-wheel cart with a metal top and canvas storm sides which were rolled up when in use. A bar handle at one end was used to push the unit from aircraft to aircraft. It was commonly referred to as “Jennie." 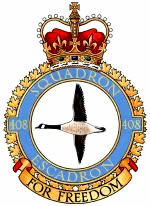 There has been little mention of RCAF 415 Squadron at Winkleigh, so far. Yet the actions of Four hundred and Fightin’ fifteen Squadron from Winkleigh in support of Coastal Command, which was initially why the air base was built, was an equally vital part of the war effort. 415 were here playing a magnificent role right through until the summer of 1944 when they were transferred to Bomber Command. But all during this time, 415 had a torpedo-bomber role to play and these men were experts in tracking down enemy submarines. The “Stringbag” or the Fairey Swordfish, was clearly one of the most important British biplanes of the Second World War & with a twofold strategic purpose - torpedo bomber & spotter - reconnaissance plane. 415 flew both Swordfish and the modified Albacore aircraft. The Swordfish in their emblem and motto "To the mark" symbolise the squadron's operational duties in attacking enemy shipping. To this section I am hoping that veterans, particularly of the Winkleigh based wing will contact me and contribute. There actions were steadfast, their successes many and yet untold. Part of a History of the Borough Town of Winkleigh, Devon & RAF airfield Winkleigh. Sponsored by: Jackie Freeman Photography. Photographs of Canadian Airmen at RAF Winkleigh 1944-45.